On the 19th of January the Houses of Parliament played host to students from Colham Manor primary school. The students had previously taken part in holiday food and fun activities run by Kitchen Social, an organisation which provides children with a safe place to go over the holidays where they can socialise and receive a healthy meal. The students took part in a fruit carving competition while staff and volunteers from holiday clubs across the UK discussed with MPs the need for government supported holiday provision. Following the event, Frank Field MP had the second reading of his School Holiday (Meals and Activities) Provision Bill. The Bill set out to ensure that every child have access to food and fun over the holidays. It would achieve this by giving local authorities both the responsibility and resource to coordinate programmes in their communities. At the debate, the Parliamentary Under-Secretary of Education Nadhim Zahawi recognised that the Government had more work to do to tackle poverty and disadvantage and that they were committed to working with stakeholders to help the most disadvantaged pupils to access healthy meals and activities over the holidays. undertake research in to the issue, including the operation and monitoring of a holiday club pilot scheme, after which time the Government would be better informed to decide next steps. You can read the full summary of the debate here. 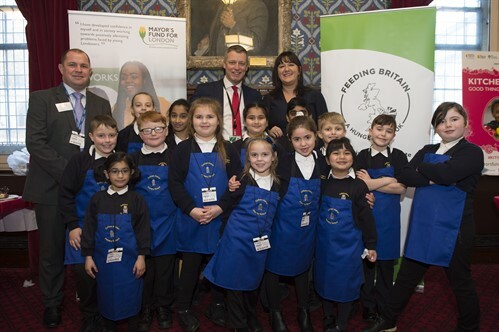 Following the debate Mr. Field called it a “very important historic day” and welcomed the government’s response and commitment to working with key stakeholders to ensure that every child has access to healthy food and activities over the school holidays. * Photos taken by Ben Stevens, courtesy of Kitchen Social, Mayors Fund for London.